Introduction to macroeconomics, definitions, circular flow and the business cycle summarized - FreeEconHelp.com, Learning Economics... Solved! 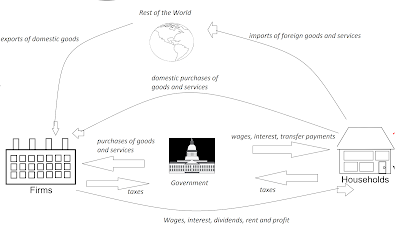 This post briefly goes over common vocabulary and definitions for the first chapters of an intro to macroeconomics course, introduces the circular flow of payments graph, the business cycle, common markets and a very brief discussion of the history of macroeconomics. First, look here to learn about the difference between Macro and Micro economics. Macroeconomics uses aggregate behavior, the behavior of all households and firms put together. change easily, and other outcomes besides equilibrium are possible in the short run (which is what matters right?). Business cycle: The ups and downs of the economy in the short term, possibly caused by shocks and interventions in the economy. Aggregate out: The total quantity of output, made up of goods and services, produced in the economy. Recession: A period during which aggregate output goes down for two quarters (3 months) in a row, but basically when aggregate output goes down. Depression: A very long and harsh recession (no real definition until after the fact). 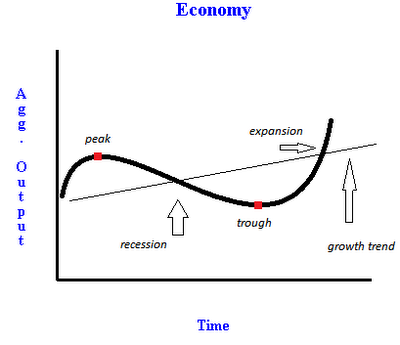 Expansion or boom: When the business cycle is in an upswing (going up) from a trough to a peak. Employment and output grow during this period. Contraction, recession, or slump: When the business cycle is in a downswing (going down) from a peak to a trough. Employment and output decline during this period. Unemployment rate: the percentage of the labor force (not population) that is unemployed. Remember that people not looking for jobs (disgruntled, retired, in school) don’t count. Inflation: an increase in the aggregate price level, ie. not just oil or food but most things in the economy. Hyperinflation is a special type of inflation that occurs when price levels grow at large rates. During a period of hyperinflation it is not uncommon to see prices double in a year. Deflation: a decrease in the aggregate price level. A more complicated circular flow of payments diagram, with households, firms, the government and the rest of the world. Circular flow: Shows how income and payments made by each sector flow through the economy. Transfer payments: cash governments made by the government to individuals who do not provide any services or goods in exchange. Includes welfare, unemployment, social security, and veterans benefits. There are three markets generally studied in macroeconomics, they are: 1)The goods and services market, 2) the labor market, and 3) the financial or money market. The goods and services market: Where firms supply or sell goods and services, and households demand or purchase them. The labor market: Where households supply or sell labor, and firms demand or purchase it. The financial market: The most common scenario is that banks supply or loan money to households or firms that demand or borrow money. Governments can also borrow money buy issuing bonds that are bought by households, firms, or the rest of the world. Treasury bills, notes and bonds are forms of promissory notes issued by the government when it borrows money. While corporate bonds use the same idea, but are for corporations. Stock shares give the holder a share in the firm’s ownership, and entitles them to a share of the firm’s profits. Dividends are the portion of a firm’s profit that are paid out each time period (monthly, quarterly or yearly are the most common) to its shareholders. There are two types of policy for governments to interact with the economy: fiscal and monetary. Monetary policy: Tools used by the Federal reserve to control the quantity of money circulating in the economy. This indirectly allows them to adjust the interest rate. Fiscal policy: Tools used by the government that allows them to change taxes and government spending. The great depression spanned from 1929 through the 1930’s. Classical economists believed that markets were self correcting, but this didn’t seem to be working. Keynes introduced modern macroeconomic ideas and developed a role for the government in fine tuning the economy. Since then another great depression has been avoided but periods of stagflation (stagnant economy, and high inflation which is bad) have occurred. The great depression and how it relates to the current economy. People felt good about the economy and invested. Investments cause people to have more money, and feel better about the economy so these actions continued. Eventually the fundamentals caught up with the speculators and the bubble burst. These ideas are partly responsible for the slumps in 1929, 1999 (internet bubble) and 2009 (housing and financial crisis). The basic purpose of education is to form awareness among folks rather than making thought among folks because it ends up in individual obscurity however a world of anger and disturbance. Just get the difference between the macroeconomic and the macroeconomics from this service. You can visit the website and get your work done in the most efficient way. See the diagram which can help you in a better way to understand this crucial term. My name is jobon, I am trying to get better information about macroeconomics for company. thanks for share this info video and images. on this site .